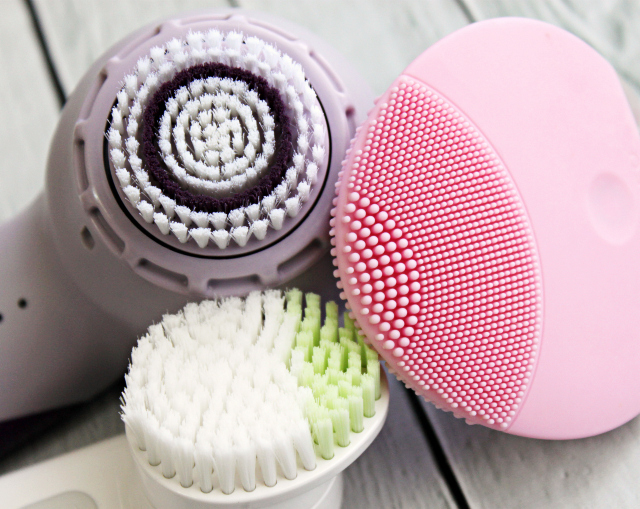 Is Your Rotating Facial Brush Helping or Hurting? Posted by Joyce with Comments Off on Is Your Rotating Facial Brush Helping or Hurting? Do you use a rotating facial brush? While they have their place, and their fans, there are some things you should know. Most rotating facial cleansing brushes are essentially exfoliating tools. The bristles physically brush away dry skin cells (exfoliation), removing dirt and makeup in the process (cleansing). While having a clean face is a good thing, healthy skin requires a certain level of natural oils and beneficial bacteria to remain present. Persistent use of these tools can strip your skin of natural oils and protection, and ultimately leading to skin damage. First, why exfoliate at all? Your skin actually does it’s own exfoliating as it creates new skin cells and sheds the rest. As you age, however, cell turn over decreases, and your skin can benefit from a bit of external help. Exfoliating the skin increases cell turnover and also stimulates the production of new cells, helping skin look fresh and rejuvenated. Exfoliation includes everything from rotating cleansing brushes, loofahs, and dry brushing to chemical peels and microdermabrasion. However, too much exfoliation can cause dryness, chronic inflammation, and skin discoloration. Any kind of exfoliation thins the skin barrier, which can lead to moisture loss and sensitivity. It is essential to moisturize afterwards and to use sunscreen, since the skin will be more susceptible to sun damage. Exfoliation can increase sun sensitivity by about 45%! If you plan on spending more time in the sun, or know that your incidental sun exposure is higher during the summer, your exfoliation routine may need to be adjusted down.